“Lack of passion leads to poor performance, which will damage any future chance of success. As a consequence it becomes progressively more and more difficult to be passionate”; Inertia is a self fulfilling prophecy. It’s been so long since I’ve actually written a blog post I thought I’d try something different. Start with something that sounds like a conclusion … and try to piece it all together. Not being able to speak manifests in not being able to write too. What does it feel like to remain silent when you should have said something? I bet you can think of occasions looking back when you wished you had found the words, any words, to say something. Say Something. When I first started blogging it was, in no small part, due to a request from another friend, Ian Davis who back in 2006 asked me to start blogging and sharing my thoughts. Whilst I was nervous and unsure of myself, Ian convinced me to try and more importantly – to believe in myself. I was still fairly new to Talis at the time and I remember asking him “what if I say something you don’t like? or the company doesn’t like?” and Ian’s response was something along the lines of “its your blog and your voice … you can say whatever you want”. Of course I realised that he wasn’t giving me free reign to give away our trade secrets (not that we had many), or use it as a platform from which to hurl abuse at managers. What he was doing was saying its ok to question, it ok to share thoughts, even concerns because if we are an organisation that values our people then we have to encourage them to have a voice. For me it was this that made us far more ‘human’ or ‘people’ focussed than the company I left in order to join Talis. Ian left Talis a few months ago, I know he has a lot to deal with, and he is! But I do miss him. He has always inspired me and he still does; for that I will always be grateful to him. I wish I had said that to him more often, I hope its something he already knew. So, back to Attitude reflecting leadership. This is a rather old post on The Apathy Cycle vs The Passion Cycle. The quote at the beginning of this post was taken from this. Whilst the post itself is quite short there’s some interesting discussion in the comments that is also worth reflecting on. What do Passion and Apathy have to do with Attitude and Leadership … perhaps nothing … perhaps everything. There’s been a lot of change recently, not only at Talis but also in other aspects of my life – family, friends, other projects I’m involved in outside of work. About the only thing that seems to remain constant is the fact that things keep changing. Dealing with change is not always easy – But you deal with it, right? I used to believe that everything changes and all that matters is how we, as individuals, choose to deal with it. But I’ve been re-thinking my position on that recently. Particularly when I think about it in the light of those things I’ve been really passionate about recently and those things I’ve been pretty apathetic towards. What is it that makes the kind of leader you would choose to follow? I’ve read books on leadership, team building and organisational culture; I’ve discussed these at length with others often more experienced in this subject area than I am. There are so many different ways of answering ‘what is a good leader’, and often when people answer they do so by pointing out the differences between Leaders and Managers. There is an important distinction, but difficult at times to articulate – I think what they all agree on is that the difference lies in the way that Leaders or Managers motivate the people who work or follow them. I know for some that’s a gross over simplification, so I’ll try to qualify this a little more. Leaders have followers, whereas Managers tend to have subordinates. Again, this is also over simplified since in many situations the same individual will have a Leadership position that requires him/her to Manage others. They are not mutually exclusive. For me the leadership qualities that are required to make a good leader will vary in different companies, teams and situations. They are entirely context-dependent. What does that mean? every situation we face is different – I am a leader to some but a follower of others. No one is always just one or the other. One of the best examples of this, certainly one that helped me understand the importance of context was the play The Admirable Crichton, in which a Lord and his Butler swap their roles as leader and servant, as the situation changes. For example: when on a desert island the butler’s practical skills are essential for survival. I might argue that in general a good leader is someone who thinks strategically, has a vision that is the source of their passion and communicates it effectively to others, inspiring them to follow; in other words enthusing others to work towards that vision because they too believe in it. Good leaders are also the ones that understand thats it’s important to boost the self esteem of others, it’s amazing what people can achieve when they believe in themselves. If you want to be technical then yes I am listing some of the qualities that are attributed to transformational leadership as opposed to transactional leadership where people are often motivated by reward or punishment and there’s a clear chain of command. I found the table at the end of this page helped as a talking point during one of the discussions I had. I don’t entirely agree with it but it was useful nonetheless. The other thing that helped was the film Twelve O’Clock High which was a more visual way of examining the effectiveness of different leadership styles and in different contexts! (had the damnedest time convincing them to watch a black and white film). I personally believe that certainly with relation to the work that I do, or the projects I’m involved in, particularly those in and around social innovation, tapping into people’s passions and empowering them works better than diktat or command and control – I’ve witnessed for example at P2PU how far passion can take a community, that is led in an open and transparent way towards shared vision. I’ve also seen how corrosive it is when people’s motivations aren’t aligned behind a shared vision. It creates uncertainty, disillusionment and possibly most damning of all … a fundamental lack of trust. Often actually more through a lack of communication and transparency than anything else. ‘the leader provides a vision, but he cant get there on his/her own – First I ask is the vision something that I believe in, does it inspire me, is it something I feel passionate about;. BUT then I ask myself how is that shared vision reflected in everyone else; In their words and actions … because you aren’t just following a person your also joining a team/community/movement.’. The prevailing attitudes embodied within any team/community/movement are a reflection of its leadership. Apathy isn’t always a result of bad members, more often its a result of uninspired leadership. That’s probably enough to think about for now. Hope this has been useful for those who asked. It’s been a while since I read something that moved me as much as this short essay by an 11th Grader. be changed but, it can be challenged. As I said, its a fascinating idea, and one that I’ve been forced to dwell on again whilst watching the brilliant anime series: Death Note, one of the most unique and mind-blowing anime in recent history. It’s the tale of a young man, Light Yagami, a brilliant young student, with perfect grades, perfect record, perfect looks etc. he’s a decent upstanding young man. All of that changes when a shinigami ( god of death ) drops his Death Note into Light’s schoolyard, where the young man stumbles across the enigmatic looking book and reads the instructions in it, the primary rule being: The human whose name is written in this note shall die. Light is initially skeptical thinking it to be a joke, but after experimenting with it he realises that the Death Note is real. Light, in a very real sense, becomes a living incarnation of the Gyges discourse, a seemingly flawless character, who is given the power to kill anyone in the world, and seizes upon this to create a new utopia with his god like power. He begins by entering the names of criminals into the Death Note: murderers, rapists, serial killers, child molesters etc. his belief is that the world would be better without them. As thousands of criminals begin to die suddenly around the world, the number of inexplicable deaths captures the attention of interpol and the mysterious detective known only as ‘L‘. It’s hard to describe L without falling back on cliches but he is a mysterious, enigmatic, eccentric genius. He has a strong sense of justice, yet his methods are sometimes as morally questionable as Lights. It’s the battle of wits that ensues between these two protagonists that makes this series such compelling viewing. Light can only kill someone if he has seen their face and can visualise it as he writes their real name in the notebook, the more he kills the more he believes himself to be a God- eventually Light becomes more than just a self-styled God, he amasses a huge following under the moniker of ‘Kira’ ( which in typical Japanese is pronounced similarly to the english word “killer” ), and soon he begins to kill anyone that threatens his plans, including FBI agents and others that are attempting to discover his identity. L, however, deduces that Kira can kill people without laying a finger on them provided he has seen their face and knows their real name. Light recognises L as his greatest nemesis and so a cat and mouse battle between the two begins. Each racing desperately to discover the others true identity first – coming second means death. The suspense is exhilarating. 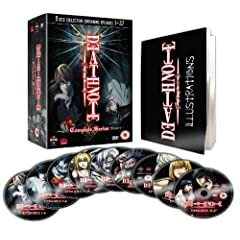 I highly recommend Death Note, it’s utterly brilliant: its dark, morally ambiguous and yet full of humour. It’s great, thought provoking entertainment.